Fire Extinguishers are available in a range of Water, Powder and CO2 to be used for extinguishing fires in a variety of conditions. We stock the following extinguishers sizes; Water 9ltr, Powder 1kg, 6kg and 9kg and CO2 2kg and 5kg. Fire Rating 34B - CO2 extinguishers are suitable for use in offices, business premises and warehouses as they cover Class B fires (involving oil, paint and petrol) and electrical fires. 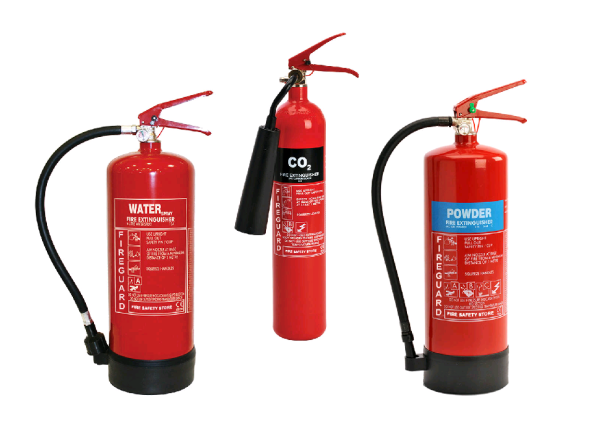 Fire Rating 8A and 34B - Powder extinguishers are ideal for work environments as they are multipurpose with the ability to extinguish fires involving Class A (materials such as paper, textiles and wood) and Class B (flammable liquids such as petrol).They can also be safe to use on electrical fires and vehicle fires. Fire Rating 34A and 183B - Powder extinguishers are ideal for work environments as they are multipurpose with the ability to extinguish fires involving Class A (materials such as paper, textiles and wood) and Class B (flammable liquids such as petrol).They can also be safe to use on electrical fires and vehicle fires. Fire Rating 43A and 233B - Powder extinguishers are ideal for work environments as they are multipurpose with the ability to extinguish fires involving Class A (materials such as paper, textiles and wood) and Class B (flammable liquids such as petrol).They can also be safe to use on electrical fires and vehicle fires. Fire Rating 21A - Water extinguishers are suitable to use in a wide range of environments, including warehouses and factories as well as office environments and public buildings for Class A fires involving free burning materials like textiles, paper and wood.